Dark paint colors make a room look smaller - wrong! 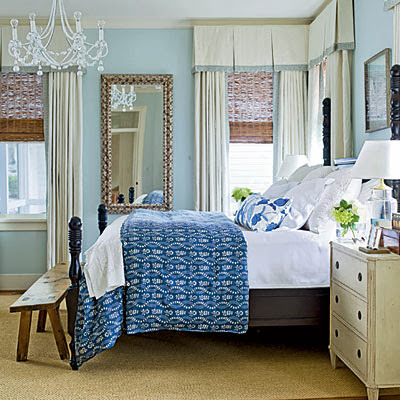 Dark paint colors give a small space the oomph it needs to look important. 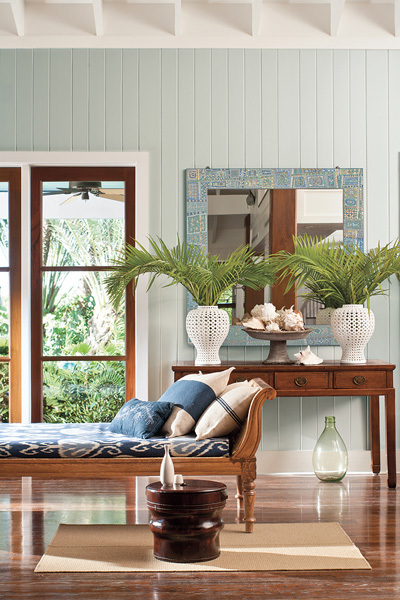 There is a warm and enveloping feeling that you can't always get from a pale shade of paint. Trim has to be either stained or painted white. Please give this one myth up ASAP! In our own home we used a medium shade of gray on our formerly lackluster white interior doors. Gray paint is not a warm color. Wrong again! Yes, some grays are cooler grays, but there's a warm gray for everybody. 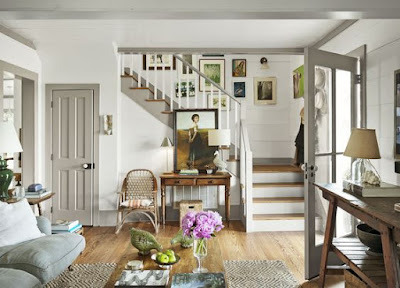 We used Benjamin Moore's Edgecomb Gray on our hallways and Foyer. It's a beigy/soft/greige that changes throughout the day. It's perfect if you want to be 'engaged' but not commit to gray. Everyone in the house has to love the color I choose. Trust me, not everyone has the faintest idea of what paint can do for a house. For instance, if your toddler craves purple, would you respect her choice and paint your home purple? If you're unsure on what color to select, look into hiring an interior designer to help make the best choice of color. All paints are the same, so buy less expensive paint. After twenty years in the business of interior design, I can speak as an expert. Do buy good paint, it will look and last better than cheaper paints. Lastly, (as much as I love my painters) let them do their work but save the color selection to you or your designer. Not every color looks the same in every house. 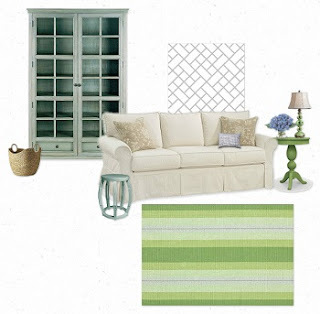 I've seen paint colors in my clients homes that I would have loved in my home. But, we have different light, floor color, furnishings and all that can change how a color looks. Puzzled about designing your Home? Today is like any other day as as interior designer. With a variety of projects to work on, it can feel overwhelming every once in awhile. It's like working with a puzzle. You have the finished work in mind, but it takes patience and concentration to pull it all together. I found this quote that explains the 'puzzle phenomenon' that can apply when decorating your home or to life in general. So it's a good thing that I love puzzles! I love finding the pieces that bring my clients' vision together. And like working on a puzzle, it takes time and thought, patience and courage to finish the project. It's not any one piece of the 'puzzle' that is important. Every piece is important. For instance, it's not just a sofa that will transform a room. It's a medley of a number of things orchestrated together to give a room life, that will give it its soul. So, be patient with yourself (or your designer). The best things in life take time! Note: The article below is published by permission of Jim O'Brien for the purpose of sharing vital information to Jersey Shore homeowners,builders and real estate companies. 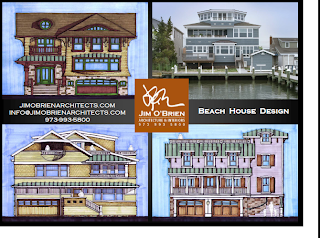 "Major Considerations Buying, Renovating and Rebuilding a Shore Home"
"As Architects we work with homeowners to select properties, buy, redesign, or rebuild homes at the Jersey Shore. The shore today is a new world with many factors driving its evolution in flux. Many local, state and federal decisions that will regulate our built environment are being made quickly, being revised and reconsidered (or delayed), or are simply in the offing out to the years of 2014, 2015 and beyond. When consulting on buying, renovating or rebuilding a shore home in this environment we focus on three major categories where we are experiencing major changes. First there are the financial aspects of buying, building/rebuilding, financing and insuring a home. Decisions there now have bigger ripple effects, many yet without precedence here, on the real value of these properties in the real estate market, both while one owns a property and when it comes time to sell. Secondly, the techniques of building at the Jersey Shore have evolved almost overnight. Newly widespread at the shore are previously uncommon factors now common to every structure’s permanence, storm-resistance, allowable height and allowable renovation or new construction techniques. Thirdly, we see the changing considerations for our sense of aesthetics & lifestyle at the shore. With many parts of the shore having been wiped away or drastically damaged, we know they will come back in a different fashion. The look and feel of our shore communities is about to change. From the experience of the rebuilt and modified boardwalks, to the replenished and relocated dunes we see as early as now and this summer, to the changes in home styles and ground floor uses we’ll see in rebuilding in every community each year to come, our choices are new once again for how to make things beautiful and how we want to live. The financial aspects of the fact that we now coexist with higher flood levels at the shore. 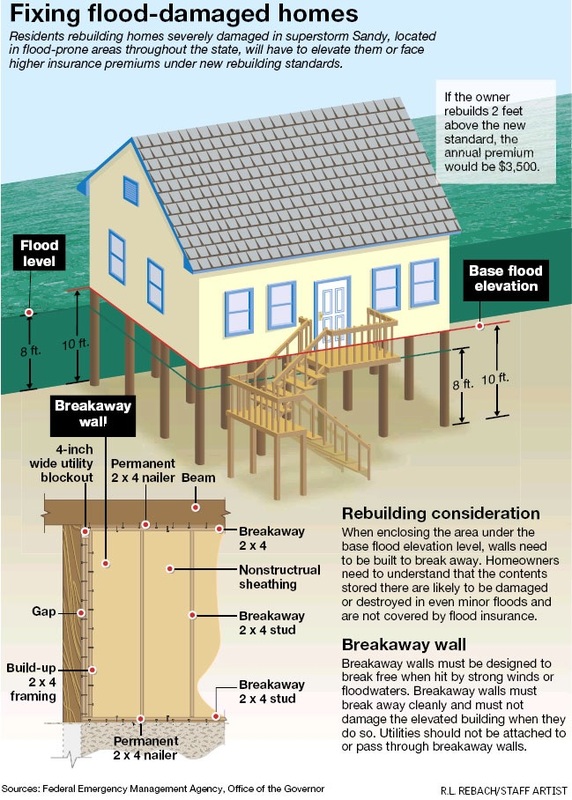 The Jersey Shore’s new Base Flood Elevations (adopted by Gov. Christie) don’t just add cost - they do save the value of Jersey Shore homes. · Base Flood Elevations, recommended by FEMA, are put down onto Flood Insurance Rate Maps that determine your flood insurance premium. If you have a property with flood insurance and at anytime it suffers damages totaling 50 percent or more of its market value, you are required in your rebuild to elevate your home to the base flood elevation, if you wish to continue having flood insurance. In so rebuilding and elevating a home flood insurance offers up to $30,000 for that work under what’s called Increased Cost of Compliance coverage. · If you are with a mortgage, your bank will require that flood insurance, so this rebuild and elevation described above is required. · If you are with no mortgage, you are the owner in full of your property, you can opt not to comply with any raising requirements, even if your home’s storm damage is more than 50% of its value. You will pay more in flood insurance. But until new rates go into effect, possibly in early 2015, insurance premiums will not be affected. 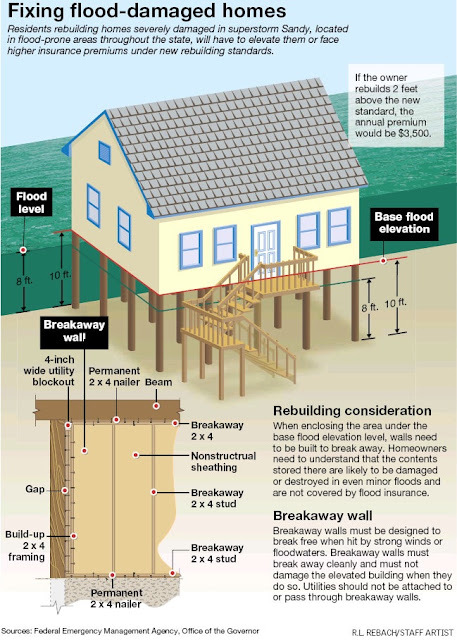 When that time comes, according to FEMA, a property that’s four feet below the advisory elevation in a high-hazard area could cost the owner roughly $31,000 a year for flood insurance. The premium drops to $7,000 if the home is at the new standard, and falls to $3,500 if the house is built two feet higher. · The financial aspects include consideration of these questions: What is the market value of a well built home if it is for sale, and is not compliant with the base flood elevation? Are there many buyers for this home? Are cash buyers motivated to buy such a home because they do not have a mortgage bank requiring them to buy flood insurance on such a home? Are higher flood insurance premiums for non-compliant homes affecting the sale price of that home, etc.? Shore homes most vulnerable to storm damage and flooding lie in what flood maps have labeled the “V” and “A” zones. The most vulnerable homes are in the "V" zones, which are waterfront areas at the highest risk for flooding and likely to have up to 3-foot breaking waves coming through land areas during a storm. These “V” zones require costly pile foundations be used in any building/rebuilding. The "A" zones covers much of the Jersey Shore just next to the “V” zones. The “A” zones aren’t as vulnerable as the "V" zones but are still subject to major storm damage. To withstand “V” and “A” zone-strength storm, wind and flood surges without damage to the house’s structure itself, we use all the engineering principles we know; from pre-planned concealed openings throughout the ground level for flood water passage, to hurricane-rated windows, doors and shutters, to internal wall bracing and structural ties from roofs to footings, elevated mechanical systems, and deep pile foundations (of wood, helical steel, and hydrojet-installed reinforced concrete). “Lifting” an existing house is a major preoccupation for many homeowners now. A house lifting association of contractors doing this work suggests the range of $14 per square foot for a simple and small house to $22 per square foot for larger and more complex homes as an estimate of the cost of raising a house up to 6 feet. The cost of raising a foundation and exterior stairs to meet the new raised house floor, and of utilities re-connections, and of any other incidental work needs to be figured in addition to that. The Allowable Building Height in each municipality is also a major preoccupation for many homeowners now. Some municipalities have raised theirs 2 to 3 feet. Many are considering that, to facilitate lifting homes and building new ones reasonably similarly proportioned to the 2-1/2 story configuration we are accustomed to seeing. Homeowners look to maximize their livable space within the allowable building heights. This can change the architecture and appearance of many Jersey Shore communities by creating homes with parking or storage on the ground floor, living areas on the second & third floors, and several options for the design treatment and use of the roof level. The Ground floor use: parking, storage, low-capital-investment living spaces, due to higher base flood elevations and likelihood of flood and storm damage here. The Ground floor look: breakaway vs. permanent. You do have a choice. Ground levels below a base flood elevation present a fork in the road for the design of a home. Do we accept the look of impermanence with breakaway walls of cement panels or plywood (see FEMA image attached), and/or the look of piling as “stilts” with no walls around them and a “home” placed above them? Does that drive a contemporary design solution? Or a podium for an awkward- or challenged-traditional home placed above it? On the other hand, likely at greater expense, do we design the ground level with a sense of and with materials of permanence? (See images attached of 3 design versions of this approach.) In this approach even a base flood elevation a full story above grade results in a house design rooted to the earth, as we use good design plus all the engineering principles we know (from pre-planned concealed openings throughout the ground level for flood water passage, to hurricane-rated windows, doors and shutters, to structural ties from roof to footings, and elevated mechanical systems,) to withstand possible storm surges thorough the ground floor with no damage to the structure itself."